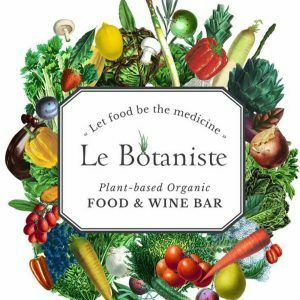 Le Botaniste, the new wine bar and café dedicated to fast, delicious, plant-based fare, arrived on the Upper East Side with a bang. 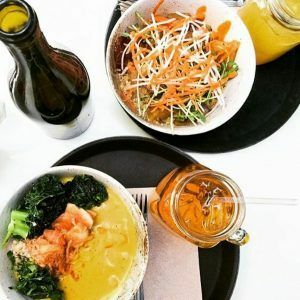 Conceived by Alan Comount, founder of Le Pain Quotidien, Le Botaniste is the slightly quirkier–and crunchier–younger sibling of the famous chain. We visited Le Botaniste on an overcast Thursday afternoon and were delighted to find the inside bright and colorful–and filled with hungry Upper East Siders. 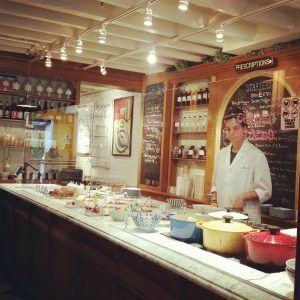 Dutch ovens squatted atop a marble counter, soups bubbled away nearby, and a decadent-looking array of desserts (think Raw Apple Volcanos and Omega-3 Brownies w/ Flax Seeds) waited patiently. 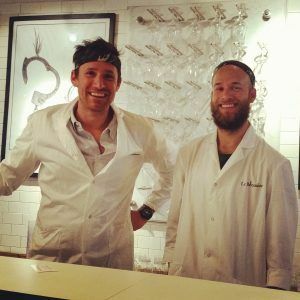 We loved that the staff were all dressed in white lab coats, meant to underscore the notion of food as medicine. 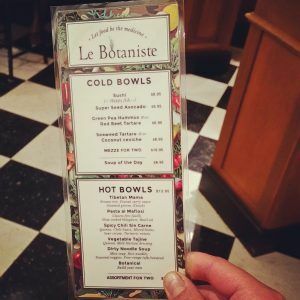 After agonizing over the large array of amazing-looking choices, we split 3 of Le Botaniste’s signature bowls: Tibetan Mama, Vegetable Tajine, and Dirty Noodle Soup. 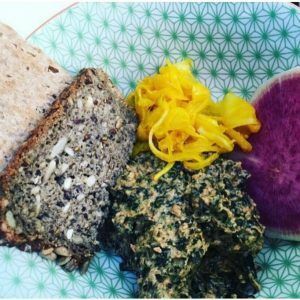 They were all delicious–wholesome-tasting and piled with high crisp, fresh vegetables. 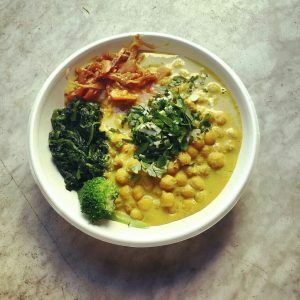 We were especially blown away by the Tibetan Mama (pictured above), a creamy dish made with brown rice, peanut curry sauce, steamed greens, and kimchi. Another favorite was the Vegetable Tajine, which consisted of lots of stewed veggies and onions, all heaped on a generous helping of quinoa and topped with a mild harissa dressing. 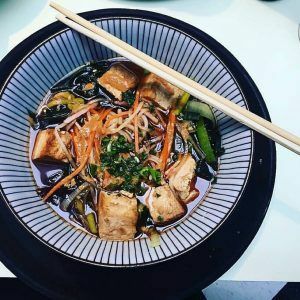 Perfect for the slightly damp day was the Dirty Noodle Soup, which had a miso base, and was thick with rice noodles, seasonal veggies, free-range tofu, and seaweed. We were already stuffed but we’d never tried Seaweed Tartare before, so we decided to go ahead and order it–and quickly found that we had no regrets! Creamy with a bit of tang, the thick seaweed concoction was accompanied by a side of deliciously dressed carrots, olives, and some crackers. 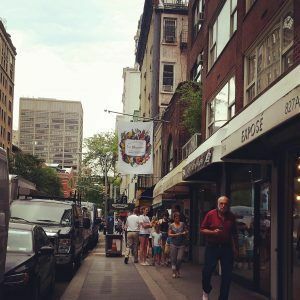 Find Le Botaniste at 833 Lexington Avenue on the Upper East Side. For more info, call 917-262-0766, or visit them online!